There is a place that makes reaching there an adventure in itself. There is the Dudh sagar near Goa. As my dotty dear’s the vacations draw near, wify dear plots and plans. It starts with subtle hints and then progresses to visible threats. WHAT ARE WE GOING TO DO ? WHERE WILL WE GO ? I think she is afraid that I will take loads of leave, stay at home and nitpick on things that should well be ignored. Growing up kids can test the patience of moms in the vacations. There must have been that aspect too. So as the Sept “Dashahara” vacations were approaching she managed to make the booking for five days in the evergreen fun place of Goa. Yes it is nice and fun in Goa. Show me someone who been there and does not like it. I like it but that sand gets me mad. It gets into all places and everywhere at all those places. Couple of days before the trip we met our neighbor in the car park and when he told us about this place Dudhsagar, I saw my chance to evade the relentless sand for a day. He said it is a short drive and that it is one heck of a place for a trek. 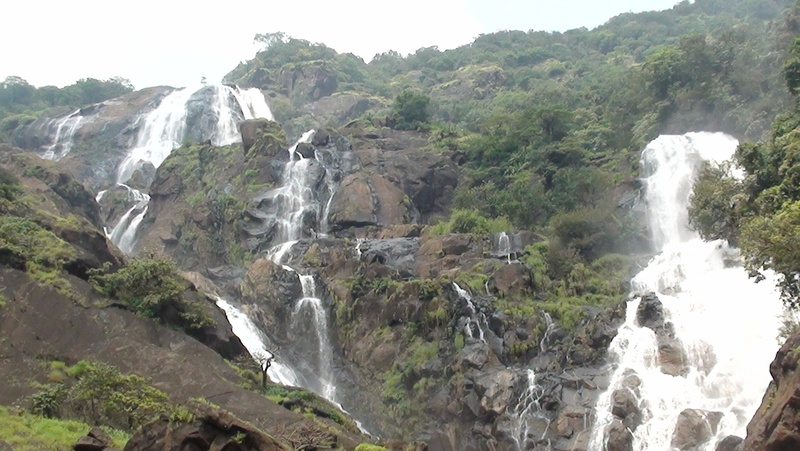 Then said man those are the falls where Deepika makes fool of her dad and Sharukh khan in “Chennai express”. The whole scene flashed before me and sealed the deal for a visit. There are two ways doing it. Take a train till castle rock and then trek for some fourteen KMs till DS, marvel at the majesty and hitch a ride back to castle rock on another train. Or. Drive till Collem, hire bike/jeep to go there. 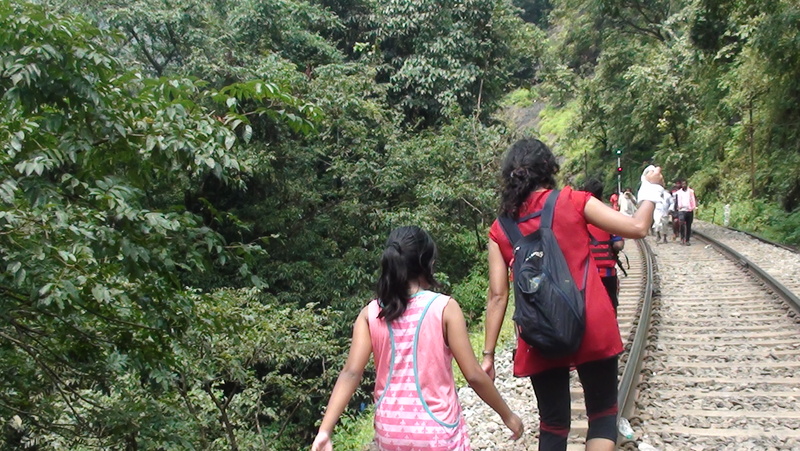 I was all for the mighty trek up, on the railway tracks, via the amazing scenery , tunnels and mini waterfalls. It will be such a welcome break from the sand and the food of the resort. But very naturally, bent by the feminine wills, we went to Collem. We parked the black beast and went to the “club” to hire the motorcycle taxis. It is funny, they said charge is 700 till the view point and then you need to trek to the falls. The bike guy will take you there but negotiate the trek part with the bike guy. Bit of a tourist trap, but the ride till the view point beats any roller coaster. One would not think any motored contraption can navigate that route. 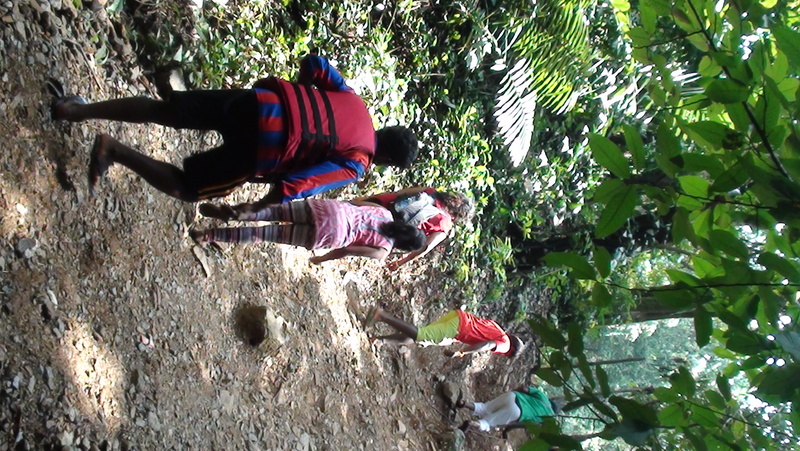 Down a slippery mountain, next to railway tracks, over “sleepers”, crossing a river. You soon learn not to put your foot down, ever, till told to. From Oct. end there are jeeps but when we went there were only these bike. It is thrill ride. My bike guy was chatty as he raced and abused Splendor. It is good ninety mins or so for about 10 KMs. When the bike crunches the gravel and tests the shock absorbers your heart does summersaults and your back side gets sore. Few times we had to get down and walk. The wretched slippery slopes or clear flowing stream. Though it was thrilling, we were glad when we reached the view point. It was a pretty sight, but the sight was not what it was made out to be. To see a waterfall from far is like watching the trailer of a thriller. You got to watch it near, feel the water, hear the roar. The bike guys asked for 300 more to take us there. 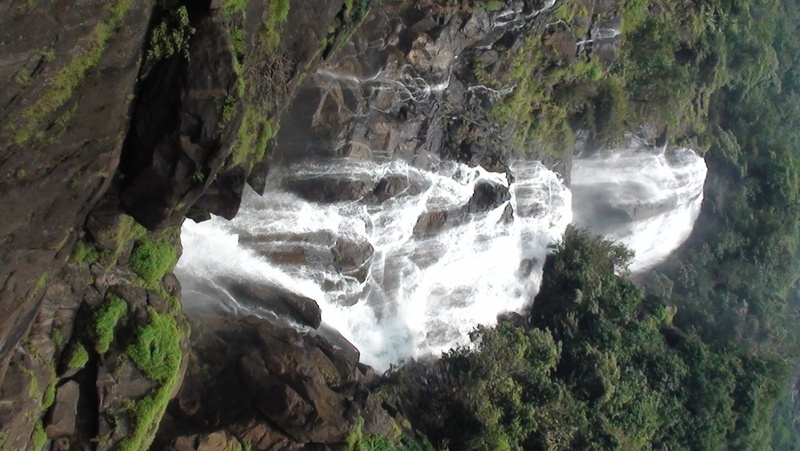 It is about a KM trek, first cross a stream that is made of water from the falls. Then climb a bit and come upon the rail tracks. Post Monsoon it was nice , cool and cloudy. 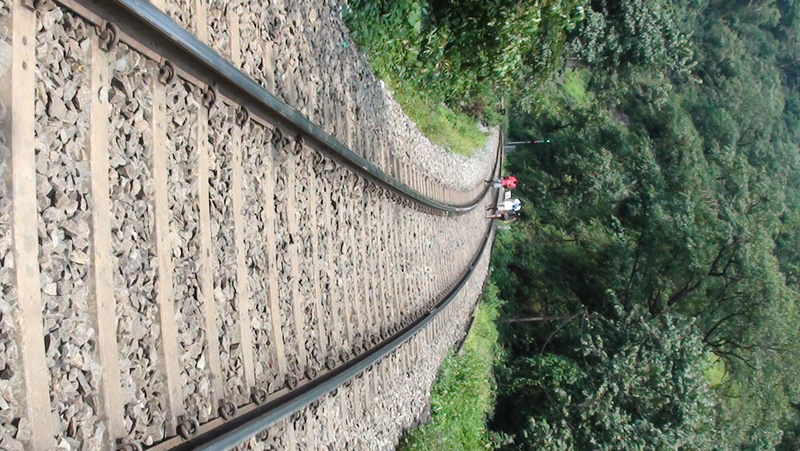 The railway tracks with trees on the side. As we reached the tracks and were posing there we heard a train whistle. We waited for it to come and it did with all the rattle and rhythm a train can make. Train passed and we talked towards the falls. Through the tunnels and passing by seeping rocks. If this small stretch was so mesmerizing wonder how would the entire 14 KMs form Castle rock would be. 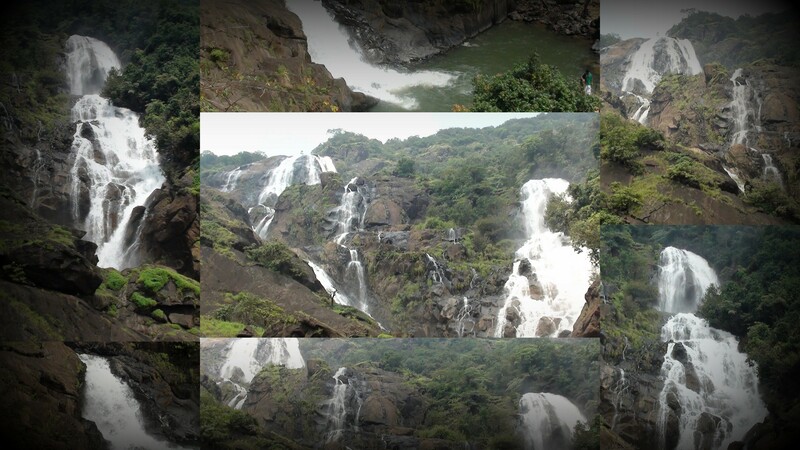 Finally we reached the falls and what a sight. Water tumbling down forms 3-4 strands, merging, swelling and making the ruckus. Unruly happy kids going for a treat. 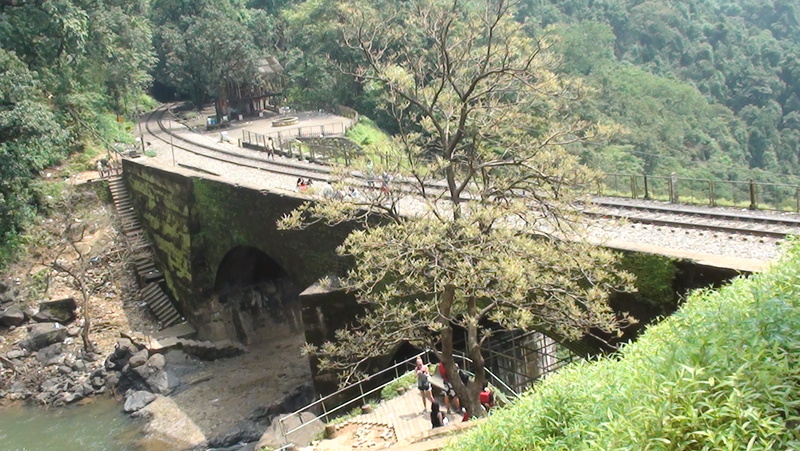 The majestic falls , stone bridge and the railway tracks juxtapose the raw with the man made. One of the few times when stone, cement and steel actually add to the charm of the place. Once we got our fill of the scene started exploring, the small hut on the side, view from other side. Saw people frolicking in the pool below. Heard it is nasty and swift, but looked like the folks were doing awright. We spent good hour and a half and started the way back. When we came back to the stream we had crossed, we went in for a quick dip. Way back. the ride was repeat thrill as the guy went faster, perhaps to make up for the time we spend walking, at the falls and in the stream. Said he takes people when is raining and also when it is dark. Thrill seekers and money to be made, combination. We reached back paid the “extra” for the trek we could have done it ourselves. I feel there is a tug between us visitors and them locals. In remote places the locals are always simple and happy to host. Money and transactions are satisfactory for both. As the tourists increase, the trust breaks. More locals rely on the tourists to make a living, tourist start to feel that they are being cheated. So it becomes a guessing game. Can I get a bargain ? Can I get more form this guy. Finally I just think if they get a hundred or two additional from us may be it is Ok. They do need to make hay while we travel. But wish we could go to the simpler times of trust, warmth and good natured people. We got our bags from the “office” had a bite and set out on the black beast. Another nice ride back on the Goan roads, another memory marked in the mind.